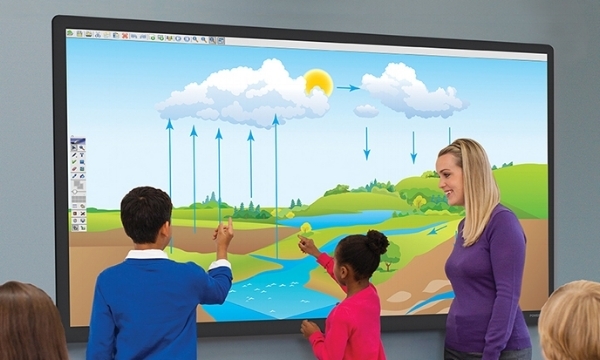 Interactive displays have become the ideal technology solution for today's classroom. With the capability of enhancing the student experience through dynamic 4K content delivery, vibrant color, and extraordinary brightness that can be seen from every corner of the room, interactive displays are designed to captivate. The interactive components built in to each display helps encourage student engagement and collaboration. Coupled with a technology based learning software, interactive displays help students better prepare for the world of tomorrow. Touch technology and collaboration brought to life, with the brilliance of Boxlight's high-definition and ultra high-definition LED flat panel Android displays. The ProColor interactive flat panel displays include the dynamic MimioStudio classroom software. It connects the Boxlight products, so using other tools—from the document camera to the pen tablet—is quick and easy. The iconic hub of today's classroom now comes in several different models. Choose unrivaled interactive displays that bring devices, education software and lesson content together, or a display that simply lets you share your screen. No matter your decision, you can be certain it meets Smart's decades long standard of quality and innovation. The award-winning ActivPanel is the premium interactive display for immersive learning, providing a tablet-like experience at the front of the classroom. ActivPanel delivers the industry’s most natural writing experience for teachers and students to collaborate with ease. The ActivPanel automatically detects differences between pen, touch, and palm erase, allowing teachers to teach efficiently without switching between software tools.